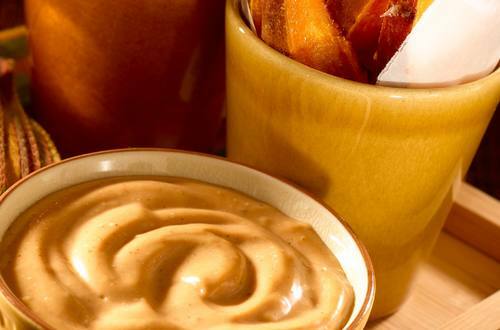 Sweet Potato Fries with a side of Barbeque Mayonnaise - requiring only 3 ingredients? Yes please! Try this super easy recipe for a side dish that goes perfectly with any burger or sandwich! 1 Preheat oven to 425°. Line 2 baking sheets with aluminum foil, then spray with nonstick cooking spray; set aside. 2 Combine potatoes with 1/2 cup Hellmann's® or Best Foods® Real Mayonnaise in large bowl; toss to coat. Arrange potatoes on prepared sheets. 3 Bake 20 minutes. Rotate sheets and bake an additional 15 minutes or potatoes are until golden and crisp. 4 Combine remaining 1/2 cup Mayonnaise with barbecue sauce in small bowl. Serve with fries.